Mardi Gras Around the World Series- Carnival of Binche, Belgium!! This is a smaller Mardi Gras than most, though it is beginning to get on the map due to their heavy duty, one of a kind Mardi Gras tradition. Binche is a Belgian town of 32,000 near the French border. They have a Mardi Gras folk tradition dating back to the 14th century, that UNESCO has designated a cultural treasure in the same class as Japan’s Nôgaku theater and Lithuania’s symbolic cross crafting. After the early wake-up call, a breakfast of Champagne and oysters is customary. 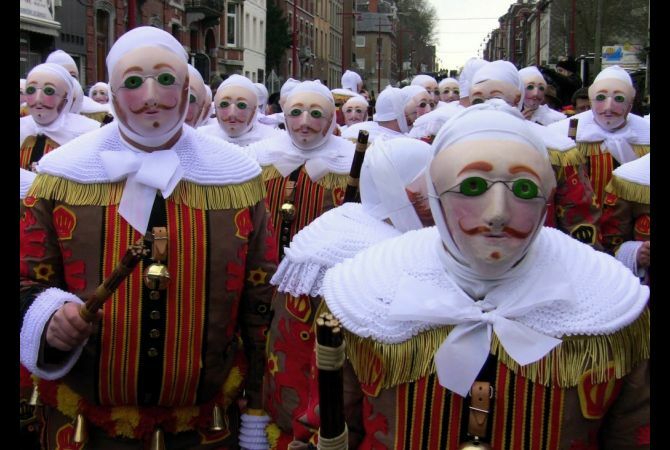 During the carnival, you’ll see Pierrot, Harlequin, and peasant costumes, but the central characters are the Gilles—local men wearing wax masks, wooden clogs, and elaborate black, red, and yellow costumes that are stuffed with hay and adorned with white collars and bells. In the mid-afternoon, nearly 1,000 Gilles converge on the town’s Grand Place, trade their masks for large ostrich-feather headdresses, sing, dance, and pelt the crowd with blood oranges, a symbol of fertility. 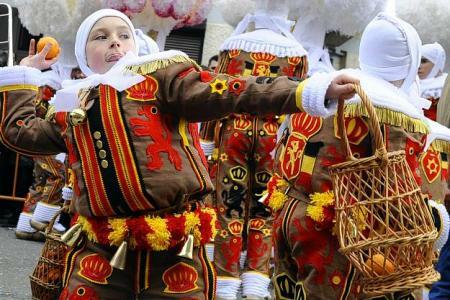 The Carnival of Binche is during the Sunday, Monday, and Tuesday preceding Ash Wednesday. 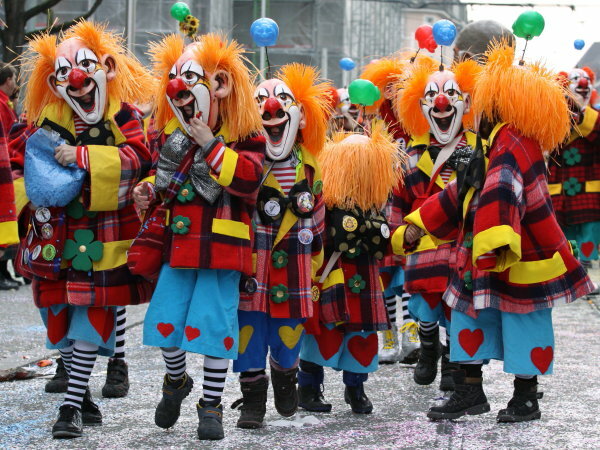 The carnival is the best known of several that take place in Belgium at the same time. Events related to the carnival begin up to seven weeks prior to the primary celebrations. Street performances and public displays traditionally occur on the Sundays approaching Ash Wednesday, consisting of prescribed musical acts, dancing, and marching. Large numbers of Binche inhabitants spend the Sunday directly prior to Ash Wednesday in costume. The centrepiece of the carnival’s proceedings are the clown-like Gilles. Appearing, for the most part, on Shrove Tuesday, they range in age from 3 to 60 years old, and are customarily male. The honour of being a Gille at the carnival is something that is aspired to by local men. From dawn on the morning of the carnival’s final day, Gilles appear in the centre of Binche, to dance to the sound of drums and ward off evil spirits with sticks. Later during the day, they don large hats adorned with ostrich plumes, which can cost more than $300 to rent, and march through the town with baskets of oranges. These oranges are thrown to, and sometimes at, members of the crowd gathered to view the procession. The vigour and longevity of the orange-throwing event has in past caused damage to property – some residents choose to seal windows to prevent this. The oranges are considered good luck because they are a gift from the Gilles and it is an insult to throw them back. Mardi Gras of the World Series- Brazil!! Brazilian Carnival, accurately spelled Carnaval, is an annual festival in Brazil. It is held four days before Ash Wednesday, the day of fasting and repentance that marks the beginning of Lent. Rio de Janeiro is the most famous city for carnival in Brazil. In carnival the different samba schools compete for the first place in elaborate parades that last for hours. 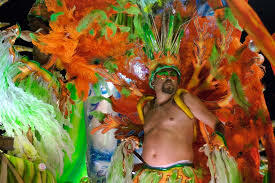 In carnival all dancers wear incredible costumes of sequins and feathers. Rio became famous in the 1930′s for their parades, parties, and balls, which become larger and more impressive every year. The parade’s history began in 1928 and used to take different routes through the city before settling on its current path. Carnival parades pass through the enormous Sambodromo, a sort of long stadium. If you want to join in the samba parade, samba schools are always looking for extra performers to be part of the show. Carnival is the most famous Brazilian holiday. During this time, Brazil attracts 70% of its tourists. Variations in carnival celebrations are observed throughout the multitude of Brazilian cities. Yet, a commonality observed among them is the incorporation of samba into the celebrations. The southeastern cities of Brazil have massive parades that take place in large sambadromes. The largest carnival celebration in Brazil and the world occurs in Rio de Janeiro, where two million people celebrate in the city. The city of Salvador also holds a large carnival celebration. The carnival begins when Rio’s mayor hands over a huge gold and silver key to Rei Momo, the Fat King. A very large number of mini street parties are held prior to the carnival proper getting underway. Smaller local parades known as blocos are held across the city and attract thousands of spectators. Despite there being 17,000 portable toilets dotted around the city for the carnival, a Pee Patrol has been appointed to clamp down on revellers urinating in the streets. Over 1/4 million jobs will be created by Carnival and it will generate £420 million for local hotels, restaurants and bars. Carnival is Brazil’s most important festival but celebrations are held in Sao Paulo, Salvador, Olinda, Recife, Manaus and Porto Alegre. 1. The carnival is a wild four-day party held 40 days before Easter. 2. It started yesterday and ends on ‘Fat Tuesday’, the day before the start of Lent, Ash Wednesday. 3. February is the hottest month of the year in Rio and the city is at its liveliest. 4. The roots of the carnival can be traced back to the Romans and Greeks who celebrated the arrival of spring with parties. 5. These traditions were carried over to the New World with Portuguese immigrants in the 1700s. 6. Their ‘Entrudo’ festival saw revellers throwing water, limes, mud and even food at each other. 7. Brazil’s carnival evolved over time with the addition of masquerade balls and then big street parades with groups of people playing music and dancing. 8. Today, carnival takes place in the city’s streets, bars and clubs. 9. Hundreds of street bands, singers and orchestras will entertain party-goers largely with samba music. 10. The carnival highlight, though, is the Samba Parade, a fierce competition between Rio’s samba schools, of which there are nearly 200. 11. Held in the purpose-built Sambodromo, the schools are judged on their elaborate floats, costumes, dancing and music. 12. Some of the schools are expected to spend up to £3 million on outfits and preparations. 13. The city’s poorest residents, from the slums, typically make up the majority of the schools. 14. Around two million people per day are expected to take to the streets this year. 15. The carnival begins when Rio’s mayor hands over a giant silver and gold key to Rei Momo, the Fat King. 16. Scores of mini street parties are held prior to the carnival proper getting underway. Smaller local parades known as ‘blocos’ are held across the city and attract thousands of spectators. 17. Despite there being 17,000 portable toilets dotted around the city for the carnival, a Pee Patrol has been appointed to clamp down on revellers urinating in the streets. 18.1/4 million jobs will be created by Carnival and it will generate £420 million for local hotels, restaurants and bars. 19. Carnival is Brazil’s most important festival but celebrations are held in Sao Paulo, Salvador, Recife, Olinda, Manaus and Porto Alegre. 20. Carnival attracts more and more celebrities with Jennifer Lopez attending last year’s event and Gangnam Style star Psy expected this weekend (from 2014). Rio and New Orleans are often considered the most desirable Carnivals to visit. I’ve been to Rio, but not for Carnival. I’m very tempted to go in the near future. Since my parade, Krewe du Vieux, rolls very early- January 31 for 2015- I can participate in my parade and the first weekend here before flying to Rio. I’m getting excited just writing this entry! 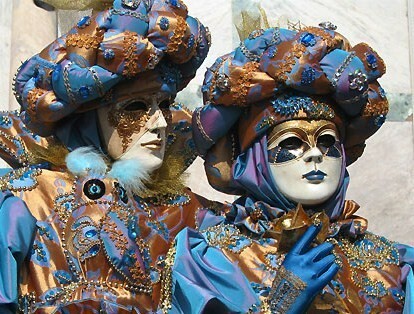 Mardi Gras Around the World Series- Venice, Italy!! From January 31 – February 17, 2015, Venice will slough off the winter gloom and burst into life. During the Carnival (Carnevale), this most magical of cities fills with a mass of masked party-goers – posing and preening, dancing and philandering, in a slightly surreal re-invention of a great tradition of the city. Glancing at the portrayals of 18th-century Venetian life in the works of Pietro Longhi or Gabriele Bella in the Querini Stampalia gallery (querinistampalia.it) or the Ca’ Rezzonico museum (visitmuve.it) will reveal that that was exactly what Venice in its party prime was all about. It’s not for everybody. It can be intensely crowded, and rates in hotels and restaurants soar. But it is a unique occasion, and a great time to see the city in a new and exciting light. In truth, those that get here mid-week during the first week might wonder what all the fuss is about: besides the skating rink in Campo San Polo and a handful of low-grade events in out-of-the-way corners, there’s not a lot to keep you busy. If it’s excitement you want, aim for the weekends, and the final weekend in particular. 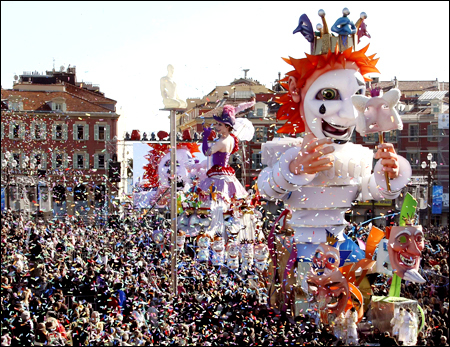 see the carnival website (carnevale.venezia.it) for more details. “Festa veneziana” (second part): Historical procession of decorated boats: the tradition of the Venetian rowing. The Venetian propensity for hiding behind masks was legendary: a rigid caste system coupled with ample opportunities for indulging in a host of vices made anonymity very desirable in an overcrowded city where detection was otherwise unavoidable. In the 13th century a law was passed banning masks while gambling. Later norms made it illegal to make masked visits to convents, or to wear masks during many religious festivals. In the end, it was easier to stipulate when masks could be worn: most importantly, in a crescendo of frantic merry making, from Boxing Day until Shrove Tuesday – the period known as Carnevale (from carnem and vale, Latin for “meat” and “farewell”: a reference to the Church’s ban on eating meat during Lent). The French stamped out the festivities when they took command of the city in 1797. And so it remained until 1979 when it dawned on local authorities that a revamped Carnevale would boost tourism in the city at a quiet, damp, misty time of year. The festival now lasts for two weeks in the run-up to Lent. 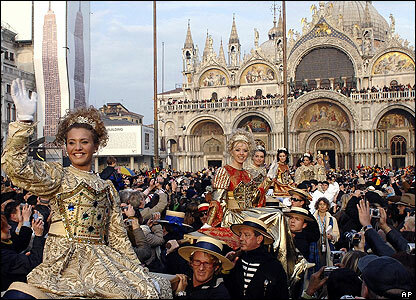 If everything to do with Venice’s Carnival gets too much, the Veneto region offers a host of alternatives, including a magnificent procession of floats in Treviso over the final Carnevale weekend, and the carnival in Verona, this latter claiming superiority over Venice having run uninterrupted since 1531. On the Friday before Shrove Tuesday, a great fat “king” parades through the street with a gnocco (dumpling) impaled on his sceptre, at the head of a procession of floats and costumed citizens. Mardi Gras Around the World Series- German Mardi Gras!! Carnival or Mardi Gras goes by many names in Germany, depending on the region and dialect. 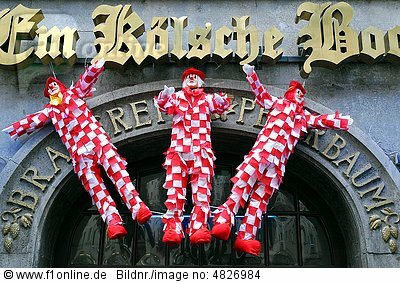 Whether you call it Fastnacht, Fasching or Karneval, it is a time for revelry, humor, and satire. They are all one and the same thing: pre-Lenten festivities celebrated in grand style in mostly the predominantly catholic regions of the German-speaking countries. The Rhineland has its Karneval; Austria, Bavaria and Berlin calls theirs Fasching; and the German Swiss celebrate Fastnacht. Although its origins go back to ancient pagan times, it is the Romans and the Italians to whom the Germans owe many aspects of their celebration. The former Roman settlements of Cologne, Bonn and Mainz still celebrate Karneval, the “fifth season.” For more about Carnival in Austria, Germany, and Switzerland see the article Die fünfte Jahreszeit. 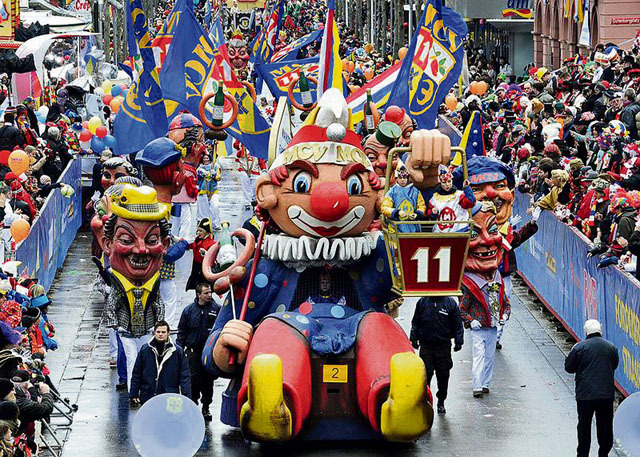 Fasching, also nicknamed fünfte Jahreszeit or närrische Saison by Germans, officially begins in most regions in Germany on the eleventh of November at 11:11 am or the day after Dreikönigstag, so on January 7th. The big bash celebrations are however not on the same given date each year, instead the date varies depending on when Easter is held. Fasching culminates into Fasching week which begins the week before Ash Wednesday. Fastnachtsdienstag – Besides some parades which are held on this day, you have the burial or burning of the Nubbel. A Nubbel is a life-size doll made of straw that embodies all of the sins committed during carnival season. It is buried or burned with great ceremony on Tuesday evening before everyone parties one more time till Ash Wednesday arrives. Fasching or Karnival celebrations stem from various beliefs and needs. For catholics, it provided a festive season of food and fun before the Lenten fasting period would begin. During the late medieval times, plays were performed during the Lenten period called Fastnachtspiele.In pre-Christian times, carnival celebrations symbolized the driving out of winter and all of its evil spirits. Hence the masks to scare away these spirits. The carnival celebrations in southern Germany and Switzerland reflect these traditions.Further, we have carnival traditions that can be traced back to historical events. After the French Revolution, the French took over Rhineland. Out of protest against French oppression, Germans from Cologne and surrounding areas would mock their politicians and leaders safely behind masks during carnival season. Even today, caricatures of politicians and other personalities can be seen boldly portrayed on floats in the parades. Helau and Alaaf are carnival cries to state either the beginning of a carnival event or greetings declared among carnival participants.